I always LOVE looking at the wallets and I fell in love with this Kate Spade one. Isn't the pink color pretty! It was $75 and I didn't really need a new wallet, so I passed on this one but I thought it was the prettiest thing! Gingham is my go to spring/summer print. 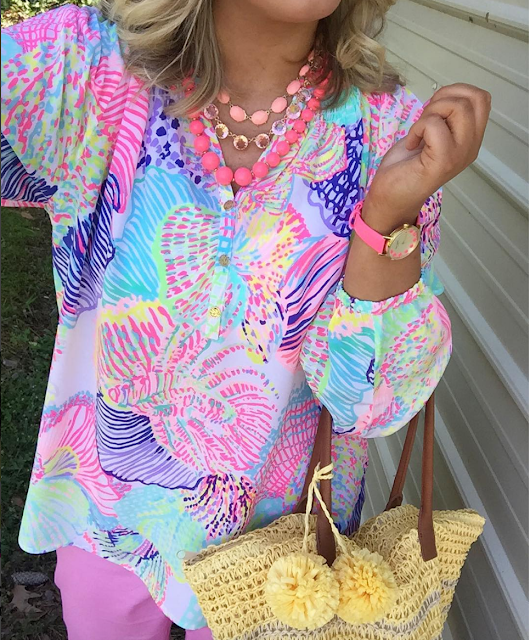 Add a bright pom to it and I'm sold! I had already picked this one up when I noticed the brand. I LOVE Vineyard Vines and I always get excited when I see it at TJ Maxx! It's a rare brand to find in the store and I just love the scarf! It definitely came home with me. I passed on these makeup brushes and bags, but I thought I'd share with y'all because they are so cute! I have an obsession with makeup bags and I have to stop myself every time I see a cute one. I'm a sucker for any fruit print so passing these up was a challenge! Call me an old lady, but slippers are my jam. Aren't these the cutest! I always have people ask on Instagram where my house shoes are from and 9 times out of 10 they come from TJ Maxx! Sometimes TJ Maxx has a lot of Kate Spade items, but shoes are always rare. I have never seen these black and white ones so I snapped a pic. They aren't my taste, but I love the stripes and little spade charm on the top. I know my teacher friends are Rae Dunn obsessed and I always think of y'all when I spot the mugs. This was the first time finding the bride and groom ones. I didn't even realized until I got home that this beach one is a Rae Dunn. I immediately snatched it up and placed it in my cart. Summer is calling my name! I've recently been spotting these gorgeous Kate Spade pillows in my local stores. I really want one, but I haven't caved in just yet. Isn't this blue and green one so pretty though! I'm doing my screened in back porch in blues and greens for this summer and this pillow would be the perfect addition. It's calling my name! If I see it again, I'm going to take it as a sign and finally get it! Now I LOVE finding Lilly Pulitzer clothes at TJ Maxx! I found this linen shirt and was so upset when I couldn't find it in my size! They even had one of the Lilly athletic shirts! Such a fun find! 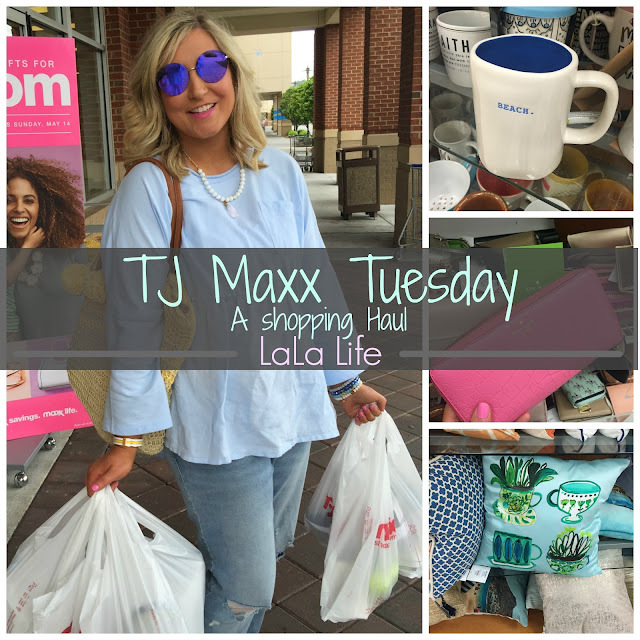 I live in Santa Barbara - and, unfortunately, there isn't a TJ Maxx around for many miles. I am sooo bummed! I almost always try to stop by TJ Maxx when I visit my bestie a few hours away. I always come back with some great stuff.